Since the last time I posted (about a month ago), Frontier has been getting a lot more attention in North America. The big websites are starting to talk more about it, and Saffron Olive of MTG Goldfish even put together a primer video on the format. They even have a Frontier metagame page where you can check out decks that people are playing. In Japan, Tokyo continues to be the epicenter of the format, but leading up to GP Chiba the other weekend, the only tournament of note was a 33 person side event at the Grand Prix that was won by Rally Combo. A quick look at Hareruya’s updated Frontier results page shows that the metagame is still wide open. While aggro decks seem to have a nice chunk of it (BR aggro, Ensoul Artifact, and UR Prowess decks), a few control decks also won some tournaments and GB Elf Harmonicon combo has also put up some good numbers. Frontier has been slow to grow in Nagoya, but a lot of standard players have been showing up to Frontier tournaments with their standard decks to see what the format is about and the number of players are growing. It also helps that the prize support for Frontier right now is amazing. At Big Magic, they are giving 6 boosters for the winner, and everybody else gets at least a pack. I managed to play in 2 tournaments since the last article, one time with GR Eldrazi Ramp and one time with my new BW Token brew. On November 20th, I used Ramp and went 2-1 at a small 5 person event. I beat a BW Enchantment deck in round 1 thanks to Ugin exiling his board, and I beat an interesting 5 Color Landfall combo deck in round 3 that used lots of fetch lands, Splendid Reclamation, and Retreat to Kazandu to put tons of tokens on Hangarback Walker and swing for huge amounts of damage in one turn. The deck also played Nissa, Vital Force and a lot of removal. The only game I lost was against GR Energy that was simply too fast and hit me too hard. This last weekend on December 11th I went 3-0 for the first time with my BW token deck at a 6 person event and was surprised at how well it did. Only one other person played a Frontier deck though (Abzan Human Company), while the others played standard decks. I beat a GR Aetherworks deck in round 1, a 4 Color Energy midrange deck round 2, and a UR Alchemist deck round 3. Gideon, Secure the Wastes, Smuggler’s Copter, and Voldaren Pariah were amazing in these match ups and simply overwhelmed my opponent’s removal. If you’re interested in seeing the list, you can check out my Planeswalkers article where I mentioned it. It will also be up on Big Magic’s Frontier page in the next week or so. I’m sure that there will be a few more players joining the tournaments during the winter holidays, and I expect the tournaments to hit double digits come next year after the big Frontier tournament at Hareruya in Tokyo. Until then, I still have some time to evaluate all of the cards available to us in the format! 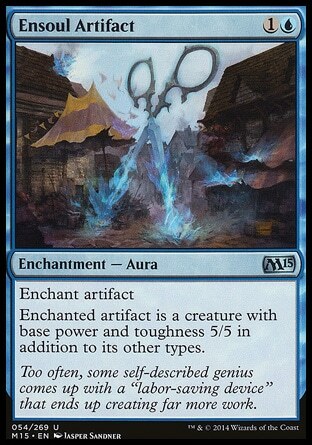 Today I’ll be going over artifacts and enchantments, and while I don’t think the list will be too long I expect there to be a lot of good cards that people have forgotten about! We’ll be doing artifacts first, and in case you’ve forgotten about my ranking system, you can read it below. There really weren’t a lot of artifacts in the Kahns of Tarkir or Shadows Over Innistrad blocks. There were some good ones in M15/Origins though, but the number of artifacts in Frontier isn’t going to skyrocket until after Aether Revolt hits. Therefore, I’ll most likely be adding in uncommon cards to “pad” the lists. If these uncommon cards see a lot of play, it would be highly likely that their prices could be more than most rares in the format so we’ll see! This card is going to see more play than you realize. It’s amazing in all of the standard decks it sees play in right now, but could you imagine play this in mono white humans, goblins, or any other aggro deck from previous standards? Giving an aggro deck a 3/3 flyer that lets them throw away land when they flood is going to be huge. It’s down to about $11.50, but that is going to go up after Aether Revolt is released and when Frontier’s popularity starts to tick up. Wouldn’t be surprised to see this hit $15 in the spring if not higher. We’ve already seen Ensoul Artifact decks doing really well in Frontier, and Ghostfire Blade ($.50) is a very important piece of that deck. Aether Revolt is only going to give the deck more cards to play with and who’s to say a Eldrazi horror deck won’t show up in the future and make use of this as well? The card was up to $5-6 when UR Thopters was in standard, and I think it can see prices like that again over the next few months. Panharmonicon has shown up in GB Elf decks and is another “build around” card that is only going to get better as Frontier grows and expands. Aetherworks Marvel ($7.75) is a known quantity in standard, but what about in Frontier? There seems to be a lot of space to play with it, and we haven’t even started to scratch the surface. If you think playing an Emrakul on turn 4 is good, how about an Ugin? Or a Garruk, Apex Predator? There are lots of fun cards just waiting to see play with Aetherworks, and I think it’s going to be a big card in the format going forward. Darksteel Citadel is a 4 of in Ensoul decks, but might be good with both Nissa Worldwaker and Nissa, Vital Force as well in mono green. I also think Fleetwheel Cruiser has lots of playability in Frontier aggro decks too. 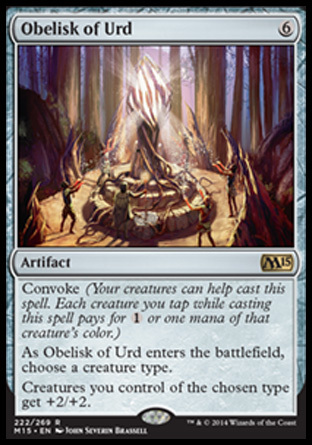 If you thought mono-white humans was bad during Shadow’s Over Innistrad standard thanks to Always Watching, then you obviously never played with Obelisk of Urd ($2.50). This card is lightyears better cause it affects tokens as well. Gobelisk (Goblins/Obelisk) was a very real deck during M15 standard, and it allows you to go wide quickly while not sacrificing any mana to do so. With enough creatures on turn 3, you can do a lot of damage on turn 4. 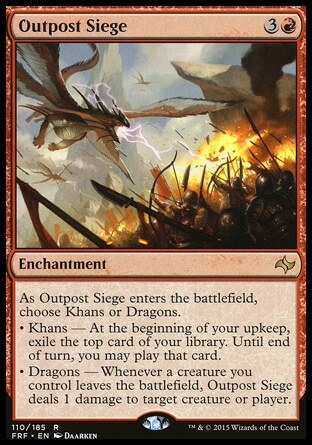 I like this card with Soldiers, Warriors, and even Servo/Thopters. While there are only a few tribes that can take advantage of the card at the moment, as the card pool grow so will this card’s potential. The UR Spell deck is still putting up good results, and before it a similar deck was playing Goggles instead ($2.25). This makes burn decks quite lethal again, giving you the ability to cast double Stoke the Flames, double Lightning Strike, or double Fall of the Titans. 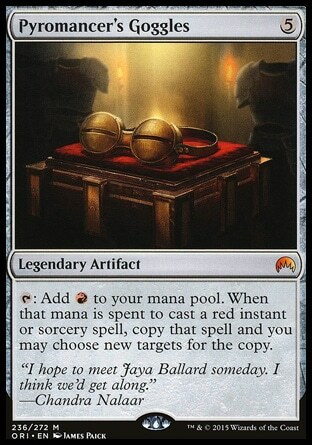 Could we possibly see a team up between Goggles, Dynavolt Tower, and Metallurgic Summonings? Maybe. This card only really saw play at the end of its time in standard, but Frontier could give it new life. While not as exciting, I think these cards could show up in the future depending on the Frontier Metagame. With 4-5 color strategies definitely a thing, it’s not unreal to think that a card like Cultivator’s Caravan could show up as a mana rock/threat. There are lots of 3-4 color aggro decks like Abzan that could benefit from the color fixing and the added threat that could easily be turned on with an Anafenza the Foremost or a leveled-up Warden of the First Tree. Dynavolt Tower, as I mentioned above would be a good card to split with Pyromancer’s Goggles in a spell deck, but by itself I think the card would be really good. Frontier adds in a lot of good burn spells which will only make it easier to charge the tower and flip a card like Thing in the Ice. Definitely playable. Key to the City seems like a good card for aggro decks as a way to push damage through, but if player’s want the most value from it they’ll have to play madness cards which relegates it to black or red decks. Skysovereign seems like a boon to midrange decks lacking in removal, and I think it will be in some sideboards. If you’re playing control in Frontier, removal doesn’t get much better than Perilous Vault ($1.75). The cost is high since you have to pay 9 mana total to exile everything, but since it gets everything but lands it might be a good card to play in a 3 color man-land control deck that uses Awaken effects from Battle For Zendikar to keep your threats in tact. While Languish is still a solid card, and Fumigate or Planar Outburst are good, the problem you’ll run into is cards like Archangel Avacyn or Gideon which simply doesn’t care if you blow up the board. If you’re not playing Ugin, Vault is the next best thing. I don’t see it being too popular, but definitely a card that could see play. Tormod’s Crypt, on the other hand, will probably end up being a sideboard staple for anybody not playing Kalitas or Anafenza that wants to deal with Rally the Ancestor decks. While it’s still unknown if Jeskai Ascendancy Combo decks will come together, I think that there will be other combo decks of sorts. 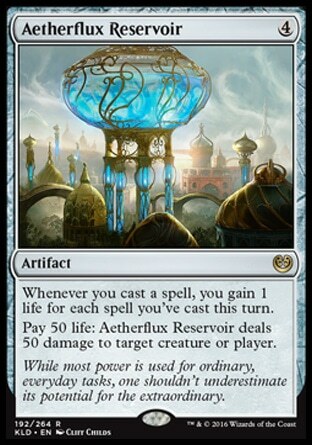 Aetherflux Reservoir seems like it could easily become a build around card in frontier when you take into account all of the low cost cards such as Ornithopter and cards that make artifacts cheaper like Foundry Inspector. Perhaps it will be a Paradoxical Outcome deck, or maybe it will show up in the SB of Jeskai Ascendancy builds as an alternate win con? I don’t know right now, but I think it has potential. Altar of the Brood also fits into the Jeskai Ascendancy combo. Brain in the Jar is definitely a fringe card, but could get stronger as removal and spells improve it’s ability to compete. A long shot but something to keep in mind. The Chain Veil ($5) seems like it could be a fun card to use as well. There are tons of planeswalkers to choose from in the Frontier format, and it’s not unrealistic to build a 5 color planeswalker control deck with Oath of Nissa and whichever other cards you like. The Chain veil would probably only be a 2 of, but still have quite the impact. Being able to put 2 tokens in play with Nissa and Gideon, or ticking Nahiri up a total of 4 counters in one turn ensures you’d be able to get your win condition the following turn. It would also be really good in a Sultai build using Liliana, Garruk, and Jace. I’d love to see people use it, but it’s another longshot and will probably only see fringe play. 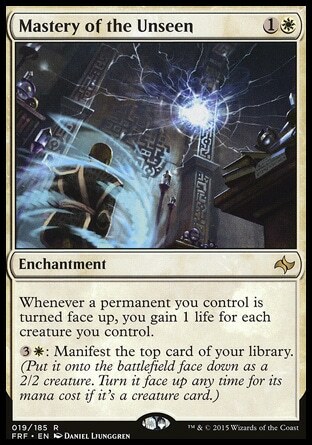 There are a decent amount of enchantments to choose from, and the most notable of which is Starfield of Nyx which by itself raises the power level of quite a few enchantments that would otherwise see little to know play. I don’t think that a lot of these cards will take center stage in Frontier, but there will definitely be a good amount of enchantments in the sideboard of a lot of decks. Just as before, I plan on adding in uncommon cards to pad the numbers. 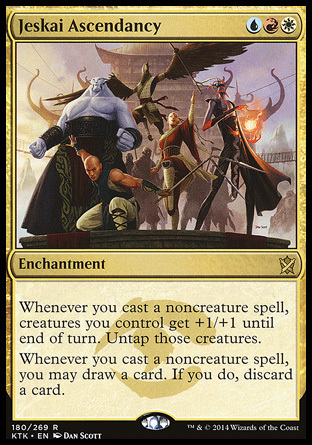 To tell the truth, I really didn’t see any enchantments that were 5 star worthy, but the closest one to it would have to be Oath of Nissa ($2). While not powerful, it is very useful, especially for green decks that don’t have card draw. While there aren’t a lot of Planeswalker decks now, I’m sure there will be eventually. 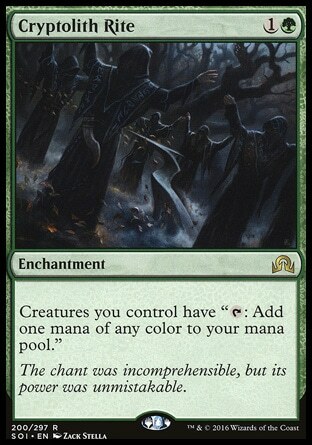 Sultai, Naya, Abzan, the list goes on and on and right in the middle will be Oath of Nissa. I’m even using it in my GR Eldrazi ramp deck and it’s been working rather well. Who’s to say it won’t show up in other decks as a 4 of as well, which is one of the criteria for being a 5 star card. 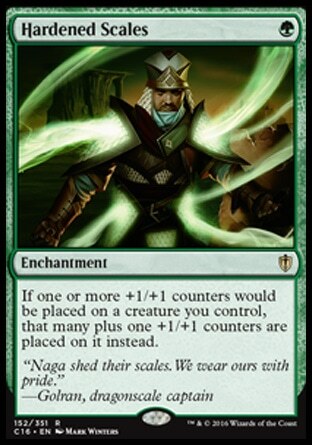 I love me some Hardened Scales ($.75), and I think the card has so far gone under the radar in Frontier. 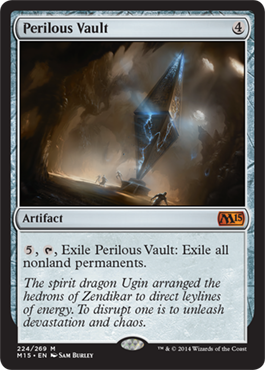 I would not be surprised to see GW Hardened Scales decks give UW/Jeskai Ensoul artifacts a run for their money. It will be a slow burn at first, but Hardened Scales will eventually break out in the format. I could see it tripling in value easily. Losing Sylvan Caryatid from Theros was a big blow to the combo deck, but there are otherways to build it and Rattleclaw Mystic is still in the format as well. While the combo deck might be under construction right now, don’t forget about Jeskai tokens. Raise the Alarm, Dragon Fodder, Monastery Mentor, and most of the other cards that made that deck great are still available, and like Hardened Scales I think it has gone under the radar. When Frontier makes it big and more people start to brew decks, you can be sure Ascendancy ($.75) will show up. Silkwrap was a strong card when it was in standard, and if Ensoul Artifact and Abzan aggro decks continue to put up good numbers we’ll definitely see more people playing it in the future. There is always the danger of Dromoka’s Command in GW decks, but for every other deck it’s rather potent. It will definitely be part of the Starfield of Nyx ($2) decks in Tier 2-2.5, along with Sigil of the Empty Throne. Ensoul Artifact is criminally undervalued at $1 right now. This is a card that sees modern play, and with a large number of early tournaments being won by artifact decks built around this card, I think it will definitely go up in value. During its standard time it got up to $4-5, and if Ensoul Artifact decks become the best Tier 1 aggro deck, you can be sure it will reach close to that price again. GW Megamorph decks have shown up quite a bit in early Frontier tournaments and I’m going to guess they were play 3, if not 4 Mastery of the Unseen. Aside from keeping your threats hidden, the incremental life gain is great against aggro decks like Atarka Red and Ensoul Artifacts. Aside from the Megamorph decks, I think it’s a good sideboard card for beatdown decks that want a way to break stalemates and gain the upper hand in games of attrition. Perhaps it will end up being a 3 star card, but for now I’m rating it 4. 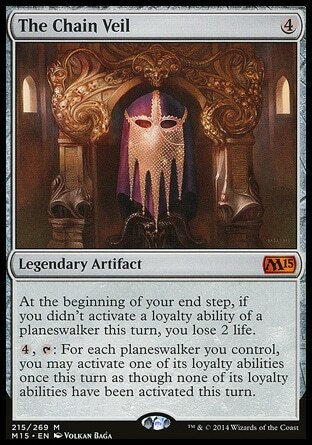 Always Watching was a 4 of in Shadows Over Innistrad standard, and I wouldn’t be shocked to see people run that deck again in Frontier as it was fast and powerful with a relative power level that would be hard for other ground based aggro decks to beat such as mono red or Atarka Red. I’m sure it will show up in another fast aggro deck in the future as well, heck it might even be good in Hardened Scales decks as a 2 of or in Starfield of Nyx builds. No we all know how strong Fevered Visions is in UR Spell decks in the current standard environment, but imagine if you will adding Sphinx’s Tutelage ($1.50). Suddenly you’re drawing 2-3 extra cards per turn while burning out your opponent and milling them to death. Dynavolt Tower might still be a good threat, but it takes time to get working while Tutelage works from the get go. While in standard Tutelage decks were consistent Tier 2 strategies and I’m starting to think that it might just be pushed up to 1.5 with the addition of Fevered Visions. It would be all to easy to mill/burn your opponent out while threatening them with a Thing in the Ice or Thermo Alchemist. Nothing too special in the 3 stars. Suspension Field is decent removal depending on the meta, Quarantine is also good for sideboards as a way to get rid of planeswalkers when you don’t have access to black and Ruinous Path, and Stasis Snare is a great addition to Starfield of Nyx strategies. I really liked this card in Mardu decks back in Kahns of Tarkir block standard, especially with tokens or aggro. It was a consistent form of card advantage, and in some situations it was an anti board wipe enchantment. When your opponent is looking at 5+ damage if they exile, destroy, or minus your creatures, they’ll think twice about it. It’s a good sidedboard card. Demonic Pact ($2) just left standard, but if you still have the itch to play dangerously you can keep on playing with it. 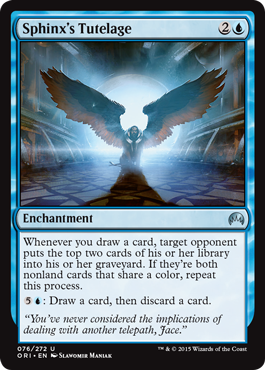 Besides having a deck of its own (UB Tentacles/Pact), you could also throw this into an Esper Starfield of Nyx build and enjoy the tears is brings to your opponents. It’s another way to play control, and depending on the metagame if can be rather powerful. Besides seeing play in the previous standard alongside Nantuko Husk in an Aristocrat like deck, it’s still playable in standard in an Brood Monitor infinite combo with Eldrazi displacer. It’s not as good as the previous Aristocrat build or Rally the Ancestors, but if you’re looking to save a little bit of money the SOI version is a bit cheaper without all the fetch lands. The card could also show up in a 4 color Jeskai Ascendancy deck. Most of these are fringe or sideboard cards, but popular enough to warrant an honorable mention. Assault Formation sees a lot of casual play still so I could see it being a build around card in Frontier, while Citadel Siege could also show up in slower midrange decks. While I think it’s too slow for the format, you never know where it might show up. Virulent Plague won’t be in many sideboards in the near future, but if token decks like BW and GW put up some good numbers, I’m sure people will have a few in their sideboards. Gryff’s Boon was a 4 of in SOI Human decks, but I’m not sure if it will show up in Frontier just yet. While giving a Goblin Rabblemaster flying would be funny, I think there are better cards to use that get damage through (like Key to the City). The last 2 cards I mentioned, Oath of Chandra and Oath of Gideon seem like they’d work well in a Planeswalker deck, but again we’re talking about fringe decks that would be popular only if the format really took off. That’s going to do it for Artifacts and Enchantments, but I’m not done yet. After a few more tournaments under might belt and more data to crunch from both the USA and Japan, I’ll be back to talk about instants and sorceries before finally covering lands and all of the common and uncommon staples that I’ve been skipping over for the sake of time. I’m not sure if all of you will agree with my picks this time, so I would appreciate if you could post any suggestions or ideas down below in the comment section. I personally am enjoying playing Frontier and brewing up new ideas, but I don’t have anything worth playing yet outside of Eldrazi ramp and BW Tokens. I hope to try out a few more ideas over the holidays, and hopefully I can include them in my next article before the new year. Thanks for reading and I hope you’ll check back again before the next standard set is released to see how Frontier has been growing! Don’t forget that you can follow @mtgfrontier on Twitter for all news Frontier and also check out Hareruya and Big Magic’s Frontier pages to see what decks players have been using over here in Japan.